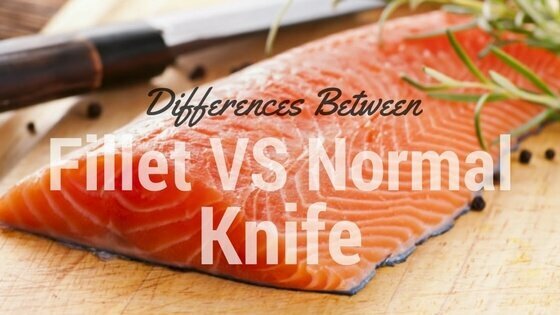 What is The difference between Normal Knife Vs Fillet Knife? Knives are some of the most valued possessions in our homes. They help us in everyday cuttings. Regular knives are more common than fillet knives. A non-chef may not understand the difference between various types of knives, but it is necessary to know them. There are lots of amazing knives designed for different purposes, and fillet knives are some of my favorite types because I’m a fisherman and I use them almost every day. It is a kitchen knife used to prepare and fillet fish. It provides good control and helps in filleting. They help us cut through fish and other kinds of meat. 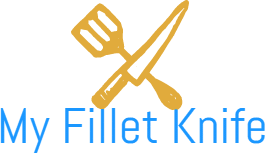 Both normal and fillet knives are composed of a blade fixed into a handle, though each of them is designed differently, and they perform different tasks. Fillet knives are meant to remove bones or a cut of meat. They are usually used for fish and other delicate meat. The normal knife is used for cuttings in the kitchen and protection, but it can do the filleting properly. On the other hand, it is not appropriate to use a filleting knife to do other cutting tasks such as boning because it might slip and cut the user. Both types of knives serve different purposes, and it’s not advisable to use any type for the purpose that it’s not designed to handle. Though even normal knives can be flexible, it is more common for fillet knives to be more flexible than normal knives. The flexibility of these knives helps for its more precise cutting of fish and other meat. It makes it perfect cutting delicate meat. It maneuvers through meat so that it makes it easy to remove skin. Normal knives are not as flexible because what they are designed to do isn’t as delicate as filleting fish. Both types of knives need to be sharp and comfortable to use, but there are areas that they vary, and flexibility is one of them. Filleting knives are thinner and usually smaller than normal knives. They are designed to be thin because of the nature of their function. It is easier to fillet fish and remove skin more carefully with a thinner knife, and that is what these knives do best. Normal knives are thicker and larger than fillet knives. What a fillet knife does, a normal knife can’t do better and vice versa. The difference in design is what makes the difference in size and thickness. When it comes to safety, all knives need to be handled with extra caution. However, normal knife looks safer than fillet knife. The design of a fillet knife makes it look less safe than a normal knife. Its blade is sharper and more pointed and slices through meat with ease, which makes it the kind of knife you’d want to use with a lot of care. However, it is worth noting that both types of knives are designed with your safety in mind, and therefore you don’t have to worry about it. Normal knives are different from electric fillet knives (check this review about Electric knife to pick one) in various ways. From the way they are constructed to the way they function, both of these types of knives have little similarities and a lot of differences. One of the most obvious differences between these two types of knives is in their prices and cost of use or maintenance. The normal knife is cheaper than electric fillet knife, especially if you are not a brand conscious person. An electric fillet knife is more expensive than a normal knife because of the way it works and the way it is constructed and the complexity involved in maintaining it. You will even spend some amount of money or time on repairs and maintenance of an electric fillet knife. Electric fillet knife also consumes electricity while normal knife doesn’t. The regular knife is used manually while electric fillet knife uses electricity to and guided by the hand. That makes electric knife easier to use than a normal knife. 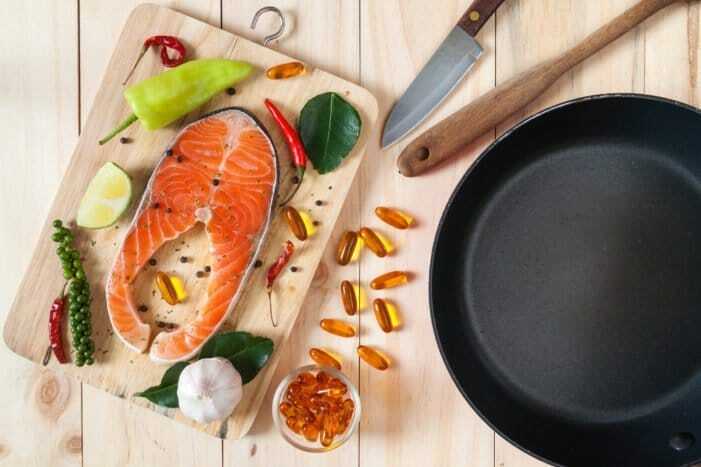 You can do much cutting with electric fillet knife before you feel the strain on your hands, unlike normal knife that uses your energy to cut through things. A normal knife is usually used for small portions of slicing or cutting while on the other hand the electric fillet knife is used for a large pile of cutting or slicing works. Electric fillet knife can be used for cutting, slicing, or filleting larger fish such as salmon or tuna, which would take edges for a normal knife to complete. Electric fillet knife does such large cutting works fast and perfectly. Fillet knives are cute to look at, and they offer more precise cutting than normal knives. However, you have to know how to choose the best if you want to enjoy filleting. Blade MaterialRead this guide myfilletknife.com/best-fillet-knife to learn how to select the best. Most fillet knife blades are made of stainless steel, and it is the best material for the blades. You still need to be seen of the stainless steel since it comes in different standards. You should look for knives with blades made of strong materials and that have non-corrosive properties. Fillet knives are better when they have flexible blades because it makes them function better. Flexible blades make the cutting process much easier. Flexibility is determined by the thickness of the blade. The thicker the blade, the less flexible it will be. The handle of a knife plays a very important role in reducing the effort needed to make clean cuts. A comfortable handle is the one that has a strong grip so that it ensures easy cutting and prevents slipping accidents when you are cutting something. Now that we all know what a fillet knife is, you can make your selection without worrying about anything. With a good fillet knife, you will enjoy every cutting experience. It makes more precise cutting for a better result and less wastage.